Glitz, Glam and Opportunity - Rotary Club of East Nassau (RCEN) President, Hope Sealey, met with Dr. Rodney Smith, President of the University of The Bahamas (UB) Friday, February 9, as the civic organization and its junior partner Rotaract, prepare to host “Puttin’ on the Ritz,” a Hollywood Glam Party set for February 16, 2018. The Glam Party is being held to raise funds for a UB scholarship honouring Rotarian Barry J. Rassin at a private home. 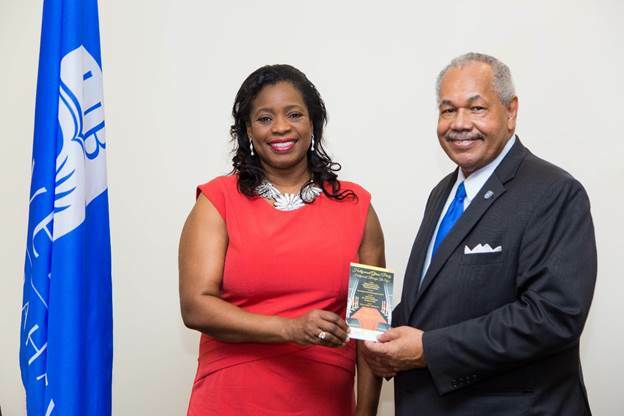 Funds raised by RCEN will pave the way for a promising student to enroll at UB, demonstrating the leadership and civic-mindedness that has propelled Rassin to the 2018-2019 Presidency of Rotary International, “an incredible honour for a Bahamian now overseeing 1.2 million Rotarians worldwide, and a testament to the kind of man Barry Rassin is,” said Sealey. Rotary supports more than two dozen scholarships. The Royal Bahamas Defence Force Pop Band is entertaining and numerous sponsors, including Wildflowers and Bahamas Ferries Ltd., have contributed to the effort. An online auction is now live www.charityauctionstoday.com/auctions/new-auction-2018-3927), days before the glamorous soiree where guests will dress as their favorite Hollywood star. Atlantis Sr. Vice President Public Affairs and radio personality Ed Fields will conduct a live auction. Among the prizes weekend stay for two at Exuma’s luxury resort, Grand Isle Villas Resort; two-night stay at Harbour Island’s famed Romora Bay Resort & Marina; stays at Schooner Bay and Treasure Cay, home of the beach that lands on the top 10 beaches of the world list regularly; day and evening passes at Sandals Royal Bahamian; an ALIV phone; spirits from Bahamian Brewery gift certificate at Oasis Furniture, tickets on Bahamasair and Bahamas Ferries and much more. The party is limited to 150 persons. Tickets are $100 and may be purchased by at The Amoury Company Limited, located on Palmdale Avenue and Teddar Street, online at www.rotaryclubeastnassua@gmail.com or by calling 437-7518.